:Introducing Drew Farthing From The Tip oF His black Homburg to the crease in his cheviot trousers, he's the epitome of a stylish 1930s English gentleman. His only problem? The body he just discovered. Drew Farthering loves a good mystery, although he generally expects to find it in the pages of a novel, not on the grounds of his country estate. With the help of beautiful and whip-smart Madeline Parker, a guest from America, Drew proposes to use the lessons he's learned reading his mysteries to solve the crime. Before long, he realizes this is no lark, and no one at Farthering Place is who he or she appears to be ? not the butler nor blackmailer, the chauffeur nor embezzler. Trying hard to remain one step ahead of the killer ? and trying harder to impress Madeline ? Drew must decide how far to take this dangerous game. About "Rules of Murder (Unabridged, 7 CDS) (#01 in Drew Farthering Mystery Audio Series)"
Customer Reviews For "Rules of Murder (Unabridged, 7 CDS) (#01 in Drew Farthering Mystery Audio Series)"
I had heard good things about this series. As a lover of British mysteries written by Dorothy Sayers, Agatha Christie ... I wondered if an American could write British mysteries. She can! a relatively rare accomplishment. This book was full of the 1930's and the dry wit of the British. I especially loved the scene when the gardener is interrogated. Cover perfectly matches the feel. The author also handled the spiritual conversations well. The only thing that bothered me was the romantic elements but thankfully they were not the main story. Why must people 'fall' for each other so quickly? Such a dangerous way to go and not a helpful model. I will be reading more of this author's work. 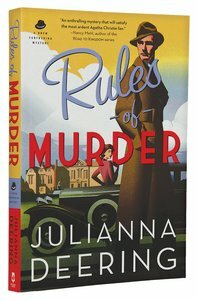 This debut novel by Julianna Deering, is an excellent mystery tale that keeps the reader entertained and captivated from start to finish. I love the period setting of 1930s England. The leading characters are endearing and I enjoyed the banter between them very much. It was also good to see how the Christian theme was demonstrated through lifestyle, rather than by mere words. I also liked the book as it kept me guessing as to who the perpetrator actually was. A thoroughly riveting read that I would highly recommend!!! Drew Fathering has returned home to the family estate in Hampshire, England, and finds his mother and stepfather are hosting a house party, and the 'odious David Lincoln' has been given his room. But other guests are more pleasant, particularly Miss Madeline Parker, his stepfather's attractive American niece. Drew finds he and Madeline share a common interest in reading detective stories: Drew's current favourite author is Ronald Knox, a Roman Catholic priest who postulated Ten Commandments of Detective Fiction. So, this is a murder mystery, and the party gives Deering a good opportunity to introduce the reader to the house guests, and to the victim. Someone dies (that's not a spoiler. It's a murder mystery. Someone has to die - see the above commandments), and Drew attempts to solve the murder with the help of Madeline and his friend, Nick. The writing was solid, and I liked the occasional injection of humour. The author has a strong voice and makes good use of vocabulary and word order to indicate the working class accent, and has a good grip on the vocabulary of the time (although I still noticed a couple of Americanisms, like a quarter after eight and inviting most everyone). But Julianna Deering has captured the essence of the genre, and I'll look forward to reading more of the Drew Fathering Mysteries. Order now to secure your copy when our stock arrives. Other edition is available. 9780764210952 0 Available. Expected to ship in 5 to 6 weeks from Australia.